MINNEAPOLIS, Minn. – Fireaway Inc. is excited to announce the addition of Mr. William (Bill) Taylor, to its sales team as regional vice president of sales NW. 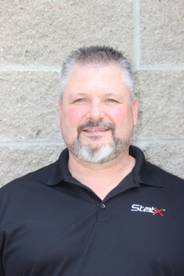 Bill will be responsible for all sales and support activities needed to grow Stat-X presence and market share. The newly established northwest sales region includes the states of Washington, Oregon, Idaho, Nevada, Utah, Wyoming, Montana, Colorado, Nebraska, North Dakota, South Dakota, Minnesota, the northern part California, Alaska, and Hawaii as well as British Columbia in Canada. A little bit about Bill. Bill brings 30 plus years of experience, knowledge and respect amongst his peers in the fire suppression industry. Most recently, he held the position of northwest regional sales manager for Buckeye Fire Equipment. He started his career in the service business, owning A-1 Fire and Safety fire service and installation company. He also worked for E2 Systems as a DOD contract designer and installer and managed Pioneer Fire and Security. His vast knowledge of the fire protection industry, products, and technologies will be a great asset to Fireaway and our distribution partners. He is familiar with aerosols and he has been a devoted supporter of Stat-X. This unique background will be the foundation upon which Bill will utilize to expand the growth of Stat-X aerosol fire suppression products. Stat-X fixed systems and Stat-X First Responders® are highly-advanced automatic condensed aerosol fire suppression solutions. These unique, robust fire suppression units are UL Listed, eco-friendly (zero ozone depletion, zero atmospheric life, and insignificant global warming potential) and non-toxic, and are saving lives and protecting property for facilities, machinery, vehicles, and industrial sites around the globe. These units are deployed in the toughest conditions worldwide, including surface and underground mines, military vehicles, long haul buses, rolling stock, remote telecom sites, wind turbines, power substations, electrical cabinets, and various marine and off-shore settings. Capable of being manually, thermally or electrically activated by industry-standard control panels, Stat-X provides highly effective and economical fire suppression solutions to customers around the world. Stat-X is manufactured by Fireaway Inc., an ISO 9001-2008 certified company with production facilities in Minnetonka, Minnesota and Minden, Louisiana. All products are manufactured in the USA using the highest quality construction materials. Inquiries may be made by mail, phone or email. Please visit our website, www.statx.com, for further information or to locate a certified distributor in your area.